Many customers ask us what the differences are between the epoxy flooring that industrial buildings use versus the ones we install in residential garages. What’s interesting is that much of the two different systems are more similar than you would expect. The short answer remains that industrial epoxy floors have added safety requirements, like no-slip additives and a higher density rating. However, the installation process is virtually identical to residential applications. 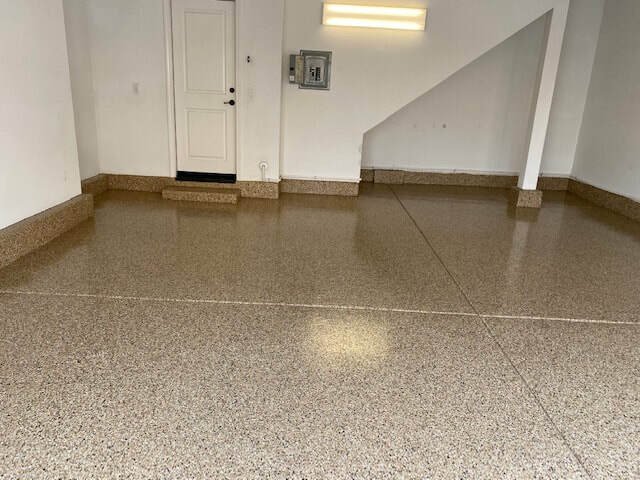 Because Garage Floor 1 Day remains the expert choice in Orange County CA, epoxy coatings for homeowners, we also stay the best choice for your needs as well. When you need an epoxy floor that can take a beating every day, we create the strongest coatings possible each time. No one else keeps your industrial buildings safer and hassle-free for less like our team. Contact us today to receive your estimate on the best quality epoxy floors. Many industrial companies rely on some form of vinyl tile system to keep their floors protected. However, some vinyl flooring types have gotten used since the 1980s and might have been discontinued by now. Vinyl tiles made of asbestos were especially popular, although now we know how dangerous that they can be. Instead, epoxy floor coatings are safe, hypoallergenic, and are ideal for nearly any flooring surfaces you have. Whether you have chemical storage spaces, high vehicle traffic areas, or other industrial needs, epoxy flooring is likely the best solution for every concern. Nothing else keeps your staff safer and your building’s floors better maintained than our best installations. Don’t keep your employees in harm’s way with outdated flooring solutions. Instead, choose the application that eliminates more concerns than any other product available. Another reason why more companies rely on epoxy floor coatings is that they can get customized entirely for most requests. You can have custom corporate colors, texturing, and brand logos applied, creating a lasting first impression for anyone who walks inside. In addition to additives to reduce slip hazards, improve UV ray resistance, more chemically defended, as well as other specific needs. Epoxy floor coatings address many daily operational concerns with one straightforward application. We chose our name because we can install most residential floor applications in only one day. Although your needs are probably for rooms that are much larger, we still guarantee faster completions without taking shortcuts. When you need to know that you’re choosing the flooring solution that you have complete control of, we offer the best in total customized epoxy applications. Choose us for the options you need the most at pricing you can afford. We understand how frustrating it is to locate industrial contractors for your company. However, our team remains the best choice for more area residents throughout Orange County than anyone else. We guarantee lasting durability and a fade resistant appearance you will love each time. Contact Garage Floors 1 Day now for all your industrial epoxy flooring needs.